Cuban treefrog, photographed at Big Cypress National Preserve, Collier County, in October 2015. The Cuban treefrog, Osteopilus septentrionalis, is the Burmese python in miniature. No, it's not a threat to humans or even large mammals, at least not directly, but this invasive little frog is wreaking havoc among Florida's ecosystems nonetheless. So much so that the University of Florida has published instructions for the public on how to off this guy. Humanely, of course. Cuban treefrogs are natives of Cuba, the Caymans and the Bahamas. They came to Florida in the 1920s as stowaways, first appearing in Key West and rapidly making their way up the Peninsula. There are confirmed breeding populations as far north as Jacksonville on the east coast and Cedar Key on the Gulf. They can be found in natural areas and in neighborhoods, where they can be considerable pests in numerous ways. Cubans are large as treefrogs go, larger than any of Florida's native treefrogs. Females can have a body length of six inches or more, while males are significantly smaller. They also have large "bug eyes." Colors can vary, from green to yellow to gray to dark brown, but according to the University of Florida, they're most likely to be creamy white or light brown. Cubans also have large toe discs. 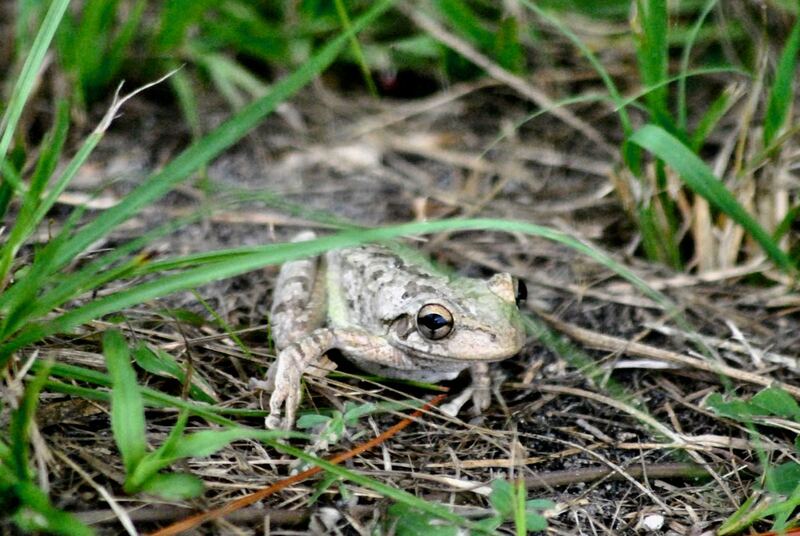 Several native treefrogs resemble these guys, but they are smaller and don't have the bug eye feature. 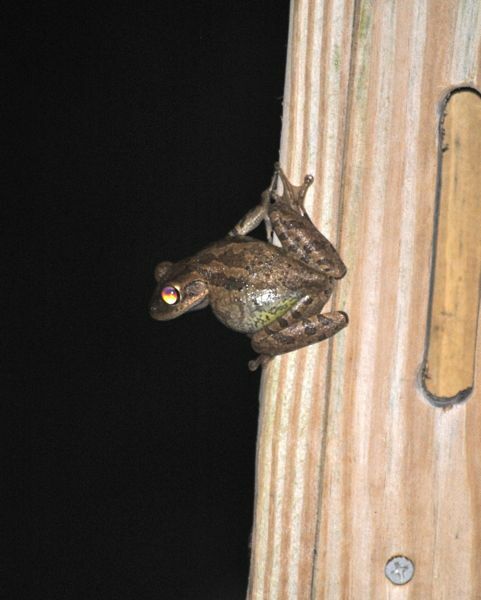 UF publishes a guide to identifying Florida's various frogs. Cuban treefrogs are killed off by cold weather, which theoretically, at least, should limit their range. However, the population rebounds quickly after a freeze. A few predators do eat them but Cubans secrete a sticky substance through their skin that puts off many potential enemies. It also can irritate human skin and cause a burning sensation if it gets into the eyes or nose. The problems Cuban treefrogs cause are many. They eat Florida's native frogs, and are believed to be responsible for their declining populations. They will eat small snakes. Cuban tadpoles inhibit the growth of at least two species of native frogs. They also eat the same foods as natives and often out-compete them, taking away habitat. 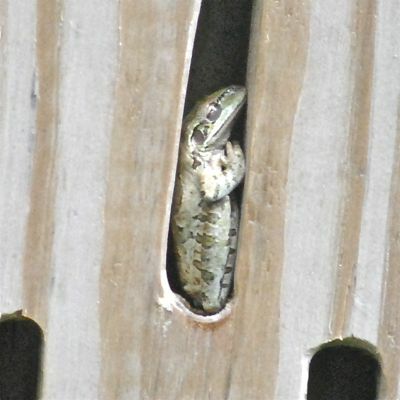 They'll hide in man-made structures, such as bird houses, which can deter the intended residents from inhabiting them. They also can climb into electrical transformers and switches, causinging short-circuits and power outages. They can climb into plumbing vents and make their way into toilets and drains. Cubans jump when startled and will land on humans — not a good thing for those who are afraid of frogs not named Kermit. Killing Cuban treefrogs isn't for the squeemish, if for no other reason than it involves catching and holding them in your hands. Next step: apply a band of an ointment containing benzocaine to their skin, put them in a plastic bag and freeze them for at 24 hours. And know what you're looking at before killing it.